Math notation is a familiar, everyday tool widely used in society. Computers need math literacy – the ability to read and write math notation – in order to assist people with accessing mathematical documents and carrying out mathematical investigations. 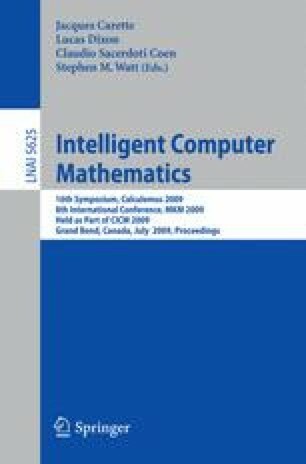 In this paper, we discuss issues in making computers math-literate. Software for generating math notation is widely used. Software for recognition of math notation is not as widely used: to avoid the intrusiveness and unpredictability of recognition errors, people often prefer to enter and edit math expressions using a computer-oriented representation, such as LaTeX or a structure-based editor. However, computer recognition of math notation is essential in large-scale recognition of mathematical documents; as well, it offers the ability to create people-centric user interfaces focused on math notation rather than computer-centric user interfaces focused on computer-oriented representations. Issues that arise in computer math literacy include the diversity of math notation, the challenges in designing effective user interfaces, and the difficulty of defining and assessing performance.